All of the Bob-Whites knew about the special friendship that existed between Jim and Trixie, and it, too, was a cause for teasing from Mart Belden. Trixie firmly denied to the other Bob-Whites, and usually to herself, as well, that Jim was a "boyfriend." Still, she had to admit that, at times, his opinion of her was more important than that of anyone outside her family. "You're not funny-looking, Trixie," Honey protested. "You're very nice-looking. If you don't believe me, you should hear what Jim said about you right before he left for camp." "What did he say?" Trixie demanded. "No, don't tell me." She covered her ears with her hands and closed her eyes. Then, realising that she was overreacting, she lowered her hands, opened her eyes, and repeated nonchalantly, "What did he say?" "What he said," Honey drawled slowly, knowing that her friend was itching with impatience, "what he said," she repeated, "was, 'As pretty as Trixie has been getting lately, I'm almost afraid to leave for camp for three weeks. When I come back, she'll probably be the belle of Sleepyside, with so many boyfriends lined up that she won't have time for old friends!" Trixie blushed violently. "Jim didn't say that," she said. "Even if he did, he was just teasing. He couldn't have meant it." "I don't think Jim really meant that you wouldn't have time for him," Honey agreed. "He knows you're too loyal a friend to let that happen. I do think he was being perfectly serious about how pretty you're getting, though." The ghost writer of this book is thought to be Laura French. 5. "The Trip Is On!" Regan disappears after a friend of Mr Wheeler's visits Manor House and brings back memories of his past. With Jim, Brian and Mart away at camp, Trixie, Honey and Dan try to uncover the link Regan has with Mr Wheeler's visitor and discover Regan's terrible secret from the past. Trixie and Honey join the Wheeler's in Saratoga where they hope to find Regan and help him clear his name of the crime many believed he committed seven years ago. Johnny - Regan's friend and a trainer at a riding stable. Louie and Scarface - they doped Gadfly's feedbag to win money off the second horse and attempted to do the same thing to Gadbox. Regan is referred to as Bill Regan for the first time since #8 The Black Jacket Mystery, and we are told that he was hired to take care of the Wheeler's horses long before they moved to the Manor House (p. 14). Dan is said to have 'unruly dark hair' (p. 17), Jim, Brian and Mart have been away for the past fortnight working as counselors at camp and would not be back for another week (p. 20). Di is away with her family in Arizona (p. 30). Trixie tells Honey and Dan to bring their bikes so they can ride to the library (p. 24). Where is the Bob-White station wagon? It's revealed later in the book that the boys drove it to summer camp. Trixie remembers the bike-a-thon and helping Nick Roberts as they ride to the library, tying the events to the author's previous book #20 The Mystery Off Telegraph Road (p. 36-37) She also refers to the time Trixie and Honey fought over Honey's cousin, Ben but refers to him as Ben Ryker - not Riker (p. 55-56). It is not spelled this way in any previous books. 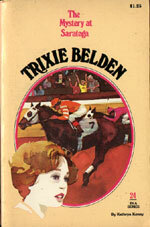 Trixie finds a reference to Regan and Mr Worthington in the book "Off the Track - Behind the Scenes in the World of Professional Horse Racing" (p. 40-44). It discusses the doping scandal involving Gadfly and names a red-haired groom as the chief suspect. Trixie tries to suggest that it may not be Regan, but Dan and Honey say there is no doubt (p. 47). Normally, it would be Honey trying to be optimistic. 'Honey who was more than willing to admit her feeling of dependence on Jim...' inferring that Trixie was dependent on Jim, but wouldn't admit it (p. 64). Helen refers to Honey's hair as blond and this is also mentioned later in the book (p. 68). I don't recall Honey ever being called a blond before, unlike Trixie. Carl Stinson, horse trainer, had been at Worthington Farms for more than twenty years and he met Regan when he was 16 and a runaway, looking for a job (p. 119). Regan was 17 when the doping scandal occurred several years ago, making him 24 in this book. Regan sold his boots because he was short of cash, providing an important clue for Trixie and Honey (p. 93). But why was he short of cash? He had room and board at the Wheeler's, what exactly was he doing with his money? Joan Stinson tells Honey and Trixie that Regan was the man she loved (p. 167). The claiming race was seven years ago, just after her mother died. She was 16 and Regan was 17. Trixie's thoughts indicate that she had wondered why Regan had never dated any of the eligible women in Sleepyside (p. 168). Did Regan still love Joan? The book ends with much promise for Regan and Joan's relationship, but unfortunately Joan is not mentioned in any later books.